Mary has been a professional painter for 20 years and an instructor for Colorado Mountain College, teaching watercolor painting courses. Mary has won numerous awards for her work, including a Merit Award for her piece "Aspen Gold" in Watercolor Magic Watermedia Showcase, an international competition. 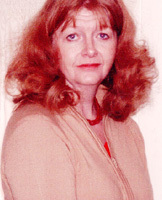 Her work has also been published in regional and national publications. She is a successful business owner selling her works from her studio in Steamboat Springs. 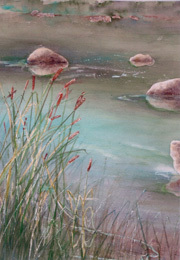 When Mary paints, she hopes the spirit of each special place is passed on to the viewer, propelling him or her to that place within themselves - reconnecting them to nature-filling them with serenity. "I feel totally connected to the place I'm painting. Be it on location, or in my studio. Nature gives me a sense of renewal-peace; it's very healing." Mary is active in her community serving as past vice president on the board of the Mixed Media Painting School of Steamboat Springs, member of Steamboat Springs Arts Council, and volunteers to teach at local schools, as well as helping to prepare local volunteers as docents for the Arts Council. Mary was born and raised in Salt Lake City, Utah and has lived and painted in many regions of the U.S. Currently she resides in Steamboat Springs, Colorado where she and her husband have raised three children and run two family owned businesses as well as her own fine art business. Page delivered in 0.00048 seconds.